This is a tumultuous time not only in America, with the nation trying to rebuild after a revolting presidential election, but also around the world. There’s an increasing concern for the future of this planet, and what we will leave future generations who will have to clean up the messes we’ve made. This concern has given bands an array of topics and concepts to lament about, even bands with a humorous edge to their material, like Iron Reagan. With half of Municipal Waste in its ranks (vocalist Tony Foresta and guitarist Phil “Landphil” Hall), an expectation of something goofy and fun-loving with Iron Reagan wouldn’t be a crazy expectation to first-time listeners. While there are intersecting points for both bands, there’s also a clear dichotomy between them. If Municipal Waste and Iron Reagan were brothers, the former would be the unemployed party animal who rages until sunrise and sleeps until sunset, while the latter has a few drinks before calling it a night to wake up early for his office job the next day. 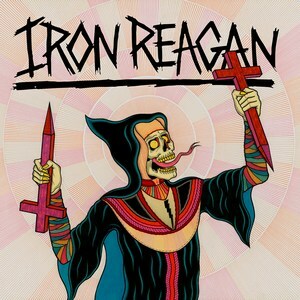 Iron Reagan’s Crossover Ministry, the group’s third full-length, hides a dark humor underneath depictions of violent unrest and political unease. The band has been venturing into more topical savviness with each album, and Crossover Ministry continues this while leaving behind a few unanswered questions. “Can we help ourselves?/Is it hopeless yet?” is asked on closer “Twist Your Fate,” with an ambiguous, “Only time will tell,” given as an answer. Though the lyrics can get bleak, the music itself is in the vein of upbeat crossover thrash. The songs are developed with a longer agenda in mind, with the fewest under-a-minute tunes of any of their other releases. Sturdy tempos on “Dead With My Friends” and the title track show off the flexibility of the group’s compositions, while keeping hold of the joyful, punky energy. Iron Reagan’s humor shines through on “F–k the Neighbors” (an anthem against pesky neighbors) and “Parents of Tomorrow” (a one-line joke). The songs are both brief diversions and a noticeable contrast to the other songs. Their existence on the album is a bit off-centered, considering how razor-sharp some of their social commentary is throughout the album. Iron Reagan has largely taken the place of Municipal Waste for Tony and Phil, with three records recorded since the last Municipal Waste album (2012’s The Fatal Feast). All the focus on Iron Reagan has given fresh life to a sound that was souring when The Fatal Feast came out. Crossover Ministry has something to say, though doesn’t take itself too seriously, as if it was a sober partygoer wading through an air of lingering booze and weed smoke.